Easily convert between Powerlink types with our all-in-one adapter cables! One of our most popular cables - this product has rapidly gained popularity with the introduction of B&Os new Powerlink format that uses "Ethernet" RJ45 connections. One of our most popular cables - this product has rapidly gained popularity with the introduction of B&Os new Powerlink format that uses "Ethernet" RJ45 connections. With so many possible applications for this cable we can't possibly list them all - simply put it gives you an incredible amount of flexibility when mixing B&O products! 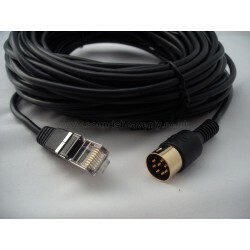 This male-to-male cable will fit all the newest B&O Powerlink RJ45 sockets (2013+ models with RJ45 "Ethernet" Powerlink type sockets) and convert to a traditional 8 pin DIN Powerlink compatible male plug*. It allows you to pair the newest B&O products to older Beolab speakers (and vice versa) - almost any role is possible with this cable. This all-in-one cable is fully-wired, making it suitable for ALL Beolab speakers, BeoVision TVs, BeoSystem, BeoPlay, Playmaker etc. * Looking for a Powerlink compatible female socket? See our shorter clip-on adapters instead! We also sell handy clip-on adapters as an alternative to this product - keep the use of your existing Powerlink wiring!